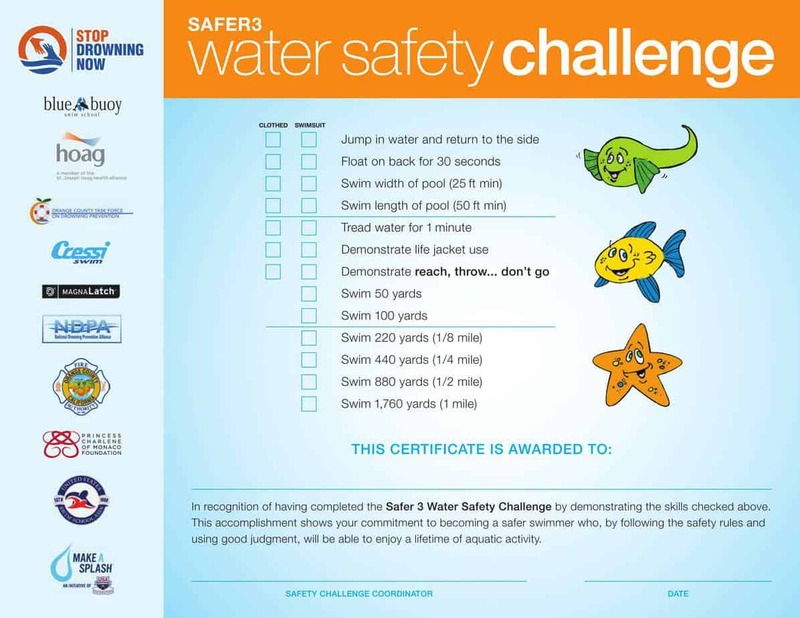 The Safer 3 Water Safety Challenge, developed by The Swim for Life Foundation, is held across the country by dozens of USSSA member schools as a way to showcase their students’ water safety skills and to bring the Safer 3 message to the families in their communities. 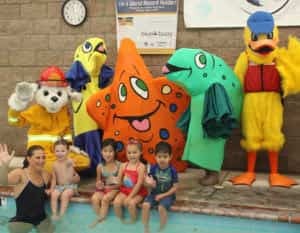 Students, parents and other family members alike may participate by demonstrating skills such as jumping into the pool, recovering balance and returning to the side;floating on the back for 30 seconds (for young children) swimming distances up to a mile; learning how to wear a coast guard approved life jacket and demonstrating a reaching rescue from the deck. Some skills may be performed in a swim suit or fully clothed. Different agencies and pool safety product vendors participate and provide attendees with valuable water safety information and materials. Food and beverages are provided for everyone’s enjoyment. Our Blue Buoy Families have a wonderful “family” day while they proudly demonstrate what they have learned and show how we can all become “Safer” in, on and around the water. Blue Buoy Swim School is a proud partner of the Swim for Life Foundation and the Safer 3 Drowning Prevention Program. Blue Buoy owners, Johnny & Cindy Johnson are the founders of the Swim for Life Foundation and creators of the Safer 3. Since its conception in 2002, the Safer 3 message has become widely recognized throughout the U.S. and internationally. It is the official water safety message of the U.S. Swim School Association, the National Drowning Prevention Alliance and enjoys collaborative partnerships in many countries around the world.